University students in different courses have vastly different lives. Some have part-time jobs, some have families to feed, and others still live at home. But what their educations have in common is that most of their learning occurs at university, in the lecture theatres, the tutorial rooms, the design studios and laboratories. Not so with medical students, because most of our education happens in the hospital. What actually happens in the hospital? What actually happens in our lives? What happens in the other teaching hospitals around the nation, or around the world? Being naturally competitive individuals, we have a tendency to compare the quality of the teaching which we receive at our different universities, different teaching hospitals – indeed, our experiences as medical students are as diverse as they are similar. Across Australia, across the world, healthcare and medical teaching is undergoing a revolution, and we’re stuck right in the middle of it. The rise of the postgraduate courses, the internship crisis and the increasing psychosocial and economic burden on international students, the increasing competition for specialty positions, the demise of anatomy teaching, simulation, virtual classes, the shift from the traditional teaching system to problem-based learning – all these are pertinent issues to medical students around Australia and around the world. 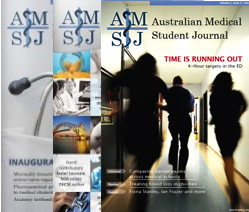 In addition to its focus on student-led research, the Australian Medical Students Journal provides a forum for tackling these issues, and provides a voice for the students. This new medical students’ blog is another way of increasing awareness about medical issues, from national health policies to the mundane, daily minutiae of medical student life. We’ll leave the objective and formal style of writing for letters and editorials in the Journal – this blog will be about our personal, biased take on the issues that matter. It will chronicle our evolution as medical students, with personal stories and different perspectives. We hope to correct some of the wrong impressions the public has of medicine and medical students, and perhaps perpetuate others. But this blog won’t just have the wishy-washy stuff – the AMSJ Blog is all about variety. It will also encompass educational articles that will hopefully be useful to medical students, like how to read an ECG, or a weird and rare disease that we rarely come across, just out of interest. Our staff, from different medical schools across Australia, will also be giving an inside scoop on the workings of the journal. We’ll be pulling back the veil with a behind-the-scenes look at how an issue goes from submissions to publication, and the sweat and tears that goes into the vigorous blinding, peer-review and author revision process. We’ll do our best to keep the AMSJ Blog updated frequently with interesting and insightful articles that we hope you’ll enjoy, and we would love to hear back from you. Welcome to our shared journey, welcome to our lives. Welcome to the AMSJ Blog.